I know this probably seems a little strange coming from someone communciating via the internet but I love to receive things in the mail - you know, the ones delivered by the postman and dropped in the letter box. Somedays, there are lovely little surprises and sometimes not so nice ones (the window faced envelope type). But I'm happy to say that only the nicest possible thing arrived yesterday. My copy of Patchwork & Stitching. I couldn't wait to open it and have a look at the project I submitted back in June. Robyn has kindly sent me the photo to post on this blog. As always the project has been displayed beautifully. 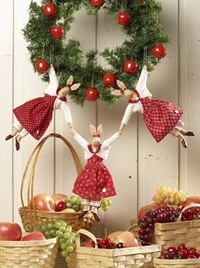 I really like them hanging from the wreath and this has given me an idea or two for my Christmas display. Individually the bunnies would make delightful gifts. I can just imagine them peeking out over the top of a stocking on Christmas morning. It goes without saying that I love them in their little red and cream outfits but they would look cute in any colour combination. If you would like to make the bunnies you will find the instructions in Patchwork & Stitching Vol 7 No 12.